Rachel Carson, famed biologist, author and visionary, was a founding member of The Nature Conservancy in Maine. Join Cori Kahn of the Conservancy for a visit to Rachel Carson Wildlife refuge in Wells, Maine, to learn more about a conservation icon. San Francisco Chronicle: Controversial chemical BPA found on paper money. Twenty-one out of the 22 $1 bills tested in California, 17 other states and Washington, D.C., carried small amounts of the chemical, which is commonly used in plastic bottles as well as in food can liners, adhesives, sports safety gear and dental sealants, according to a report being released today by the group Safer Chemicals, Healthy Families. More . . .
Armendariz said the EPA is “very concerned” that natural gas could migrate into the home through waterlines, leading to a fire or explosion. More . . .
A chemical in toothpastes and soaps has been linked with brain damage to babies in the womb. Scientists fear pregnant women who are exposed to high levels of the chemical, called triclosan, may be putting their babies at risk. Alarming new findings suggest triclosan may disrupt the flow of blood to the uterus, starving a baby’s brain of the oxygen it needs to develop properly. Last night researchers involved in the study called for urgent investigations into the dangers to unborn babies. More . . .
Reuters: Study links cellphones to child misbehavior. Researchers studying the health effects of cellphones say they have found evidence that when pregnant women use them regularly, their children are more likely to have behavioral problems. The study, sure to renew controversy over the safety of mobile telephones, does not demonstrate that cellphone use causes the behavioral problems and does not suggest a possible way that they could. But the researchers say their findings are worth checking out. “It is hard to understand how such low exposures could be influential,” Dr. Leeka Kheifets, an epidemiologist at the University of California Los Angeles who led the study, said in a telephone interview. “It is just something that needs to be pursued.” More . . .
Bloomberg News: Lead in most U.S. holiday tree lights poses hazard for kids, group says. Fifty-four percent of holiday lights tested in a U.S. study had more lead than regulators permit in children’s products, with some strands containing more than 30 times those levels. Consumers should wash their hands after handling holiday lights, according to HealthyStuff.org, a product-information website that posted the data today. The Ecology Center, the Ann Arbor, Michigan-based group which runs HealthyStuff.org, tested 68 light sets in the study. More . . .
Joe Kiger, a Parkersburg, W.Va., school teacher suffering from liver disease, describes the class-action lawsuit he filed in 2001 alleging he and thousands of citizens were being poisoned by DuPont’s C8 in their drinking water. His suit ended in a multimillion-dollar cleanup effort and a medical study funded by the company for area residents devastated by cancer and other ailments. From the mountains of Kentucky, to the innercity neighborhoods of Chicago, the entire life cycle of coal is filthy – from disastrous mining practices like mountaintop removal, to toxic emissions. What is the true cost of coal on our planet, and on the lives and health of ordinary Americans? Hear firsthand stories from local activists Nina and Mickey McCoy (Inez, KY), and Leila Mendez (Chicago). Washington Post: Lead may be leaching into thousands of D.C. homes. The water in almost 15,000 D.C. homes that received repairs during a massive effort to remove lead pipes may still be contaminated by dangerous levels of the metal, according to a report released Wednesday by the Centers for Disease Control and Prevention. If those residences are home to small children, pregnant women or anyone with a compromised immune system, the water should be tested, said George Hawkins, general manager of D.C. Water. The CDC concluded that homeowners who had pipes only partially replaced may have made the problem worse. The center also confirmed that children living in the District were exposed to an increased risk of lead poisoning from 2000 to 2006 as an inadvertent result of efforts to disinfect the water supply that caused lead pipes to corrode and leach into the water that flowed through them. More . . . Discovery Channel: BPA may inhibit pregnancy. Even as women choose to have babies later in life, more are having trouble conceiving, and the chemical BPA might be partly to blame, suggests a new study. Mice that were exposed to tiny amounts of the common chemical in the womb and shortly after birth had no problems getting pregnant early in their reproductive lives, the study found. But the animals were less likely to get pregnant as they aged compared to animals that had not been exposed to BPA, and they gave birth to smaller litters as time wore on. People come in contact with BPA, also known as bisphenol A, through cash register receipts, canned foods and beverages, hard plastic bottles, kitchenware, DVDs and many other sources. Just about all of us have BPA in our bodies, where it can interfere with the action of estrogen and other hormones. That process, accumulating evidence suggests, might lead to all sorts of negative health consequences, including some cancers, behavioral issues, and developmental problems. More . . .
Agence France-Presse: Working with pesticides linked to dementia, study shows. Long-term exposure to pesticides may increase the risk of Alzheimer’s disease and other forms of dementia, according to a study released Thursday. Workers “directly exposed” to bug and weed killers while toiling in the prestigious vineyards of Bordeaux, France were five times more likely to score less well on a battery of neurological tests than those with minimal or no exposure, the study found. As revealing, this high-exposure group was twice as likely to register a significantly sharp drop in a key test — frequently used to diagnose dementia — repeated four years after the initial examination. The drop “is particularly striking in view of the short duration of follow up and the relatively young age of the participants,” mostly in their late 40s or 50s, the authors said. More . . .
Our organizers work to heighten community awareness, develop environmental strategies and participatory community planning practices, and promote sustainable development, governmental accountability and environmental justice. Of primary concern are issues of waterfront development, land use, brownfields, transportation, air quality, open space, alternative energy, and environmental health. Environmental Protection Agency Administrator Lisa P. Jackson statement at The State of Environmental Justice in America Conference 2009. In my interview of Dr. Frederica Perera (professor at the Mailman School of Public Health and Director of the Columbia Center for Children’s Environmental Health), I asked about her about what solutions might exist for the environmental health problems that she has famously documented. This video contains her responses to the prompts listed below. More of the Perera interview is here. 5250 Ppb Hexavalent Chromium has been found in many of the drinking water wells in the Cotton Flat Neighborhood of south Midland and unincorporated Midland County Texas. In some cases, the amount of Hexavalent Chromium is 500 times over the EPA 100 legal limit. This dangerous pollutant can lead to skin irritation, throat and lung irritation, and a multitude of cancers. Erin Brockovich and Bob Bowcock speak with residents regarding how to get safe water to there families. 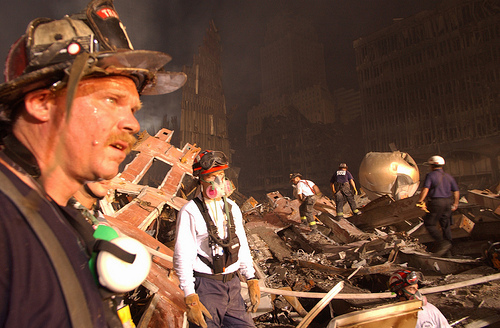 Many Upstream readers are already familiar with the World Trade Center Medical Monitoring & Treatment Program, established so that “9/11 responders can come to the program for free, confidential and regular medical monitoring examinations.” Most also have heard some of the sad facts about the significant health effects those heroic individuals are enduring as a consequence of their exposure to environmental toxins while working at Ground Zero. In the Daily Show’s final episode of 2010, Jon Stewart took the United States Senate and the media to task for failing to give the Zadroga bill priority. James Zadroga was a first responder (NYPD) who died in 2006 of respiratory disease thought to be caused by his work following the World Trade Center bombing. (His story from CBS News is here.) Since then, the negative health consequences for many police, firefighters, emergency technicians, and cleanup crews who spent months in the wreckage has become increasingly apparent. The Zadroga bill would create a trust fund to cover the health care costs of those indivuals — a small price to pay for giant sacrifices. The story has many angles, but one that strikes me is from these first responders’ account of how Workers Compensation administrators have denied their claims by arguing that the diseases are not the consequence of environmental toxins — illustrating one of the many ways in which our society fails to take seriously issues of environmental health and environmental justice. My hope is that Stewart’s efforts will pay off for this second wave of 911 victims and that the story of these environmental victims will serve as a reminder to all of us about the connection between the environment and health. *Photo by Andrea Booher/ FEMA News Photo.